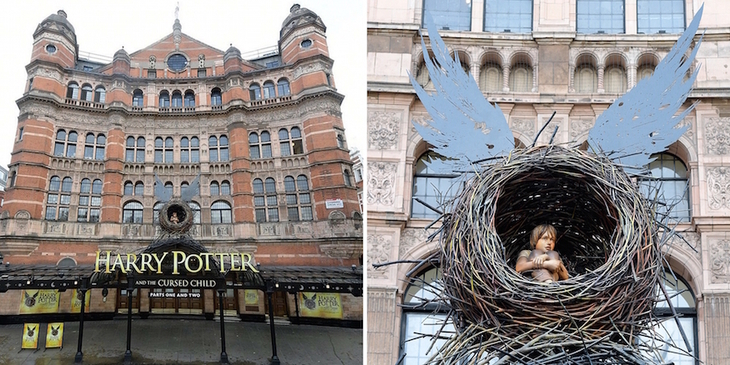 Here's a list of London locations connected to the phenomenal Boy Wizard's story; as well as some Potter-themed tours, shops and special events to indulge your Harry devotion. The railway connection between the Muggle world and Hogwarts leaves from Platform 9 3/4 at King's Cross Station, a platform concealed behind a solid wall barrier. It was at King's Cross that JK Rowling's parents first met, travelling on a train to Scotland; the author says the station is 'evocative and symbolic' for her. 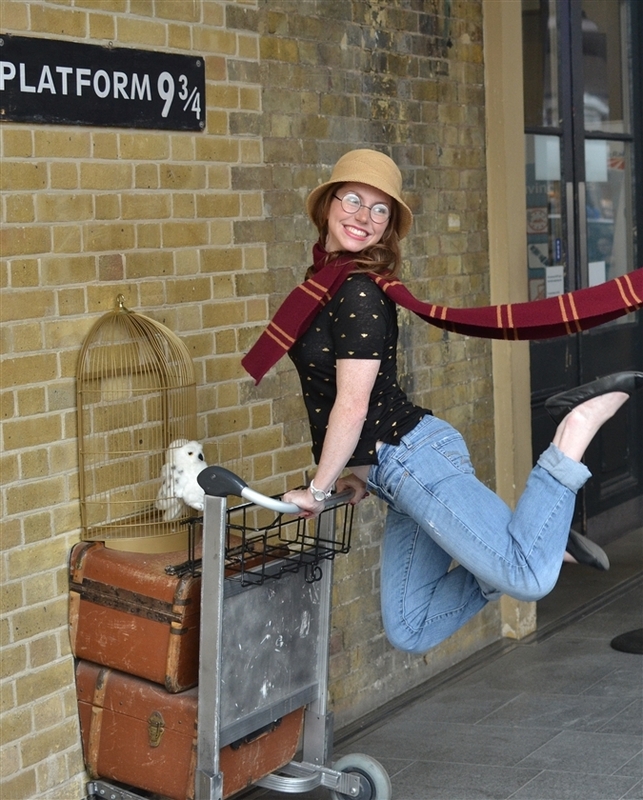 Today, you can pose for pictures alongside the platform sign and a trolley 'stuck' between our world and the wizarding one. In the films, the layout of King's Cross posed a problem: platforms 9 and 10 aren't actually adjacent. Instead, the filmmakers renamed platforms 4 and 5 for the filming. If you're interested in visiting the location in the film, you'll need to head to the arches between these two platforms. With its more picturesque exterior, neighbouring St Pancras Station is used in the Harry Potter films as the outside of King's Cross. As fans of George Gilbert Scott's incredible gothic cathedral, we can't really blame them. Harry and Ron memorably park their Ford Anglia on the station courtyard in Harry Potter And The Chamber of Secrets, only to miss the Hogwart's Express, and be forced to fly over and around that impressive clock tower. In the film, you can clearly see the statue to Guy the Gorilla, one of London Zoo's most famous residents, outside the Reptile House. 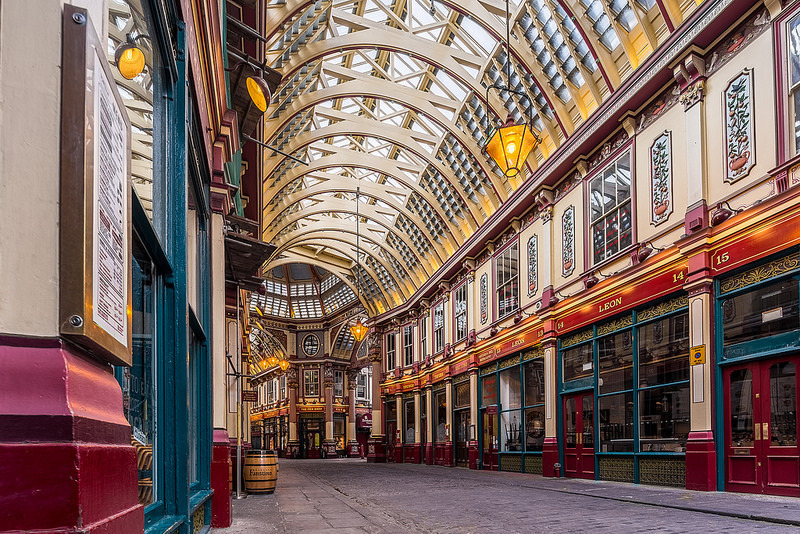 The beautiful Victorian covered market in the City of London, Leadenhall Market is partly used as the wizard-world shopping street Diagon Alley in Harry Potter and the Philosopher's Stone. The entrance to wizarding pub and inn, The Leaky Cauldron in this film, is an opticians in Bull's Head Passage, inside Leadenhall. In Harry Potter and the Prisoner of Azkaban, Harry is rescued from another terrible summer holiday with the Dursleys by the Knight Bus. A purple triple decker with magical powers, the Knight Bus speeds wildly down London's Green Lanes from Bourne Hill before swerving sharp left into Park Avenue, accompanied by the chatter of the Lenny Henry-voiced shrunken head. The Knight Bus then passes over Lambeth Bridge, squeezing between two regular London double-deckers. Eagle-eyed watchers will spot the bus is actually travelling in the wrong direction (from south to north London) as it crosses the Thames... Magic, right?! As the films move on, some locations change. The Leaky Cauldron moves from Leadenhall Market to Borough Market in Harry Potter and the Prisoner of Azkaban. 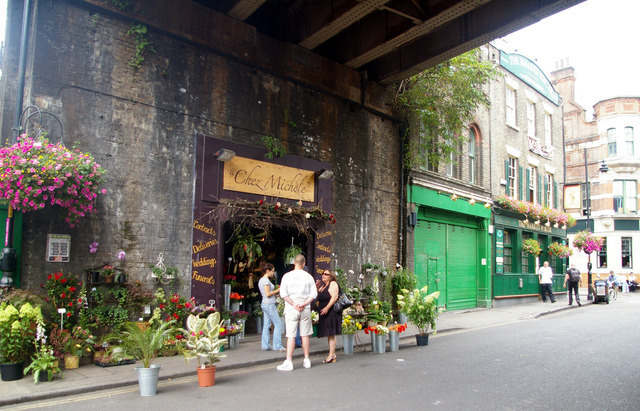 In the later film, the entrance to the wizards' pub and inn is located at 7 Stoney Street beneath the railway bridge in Borough. 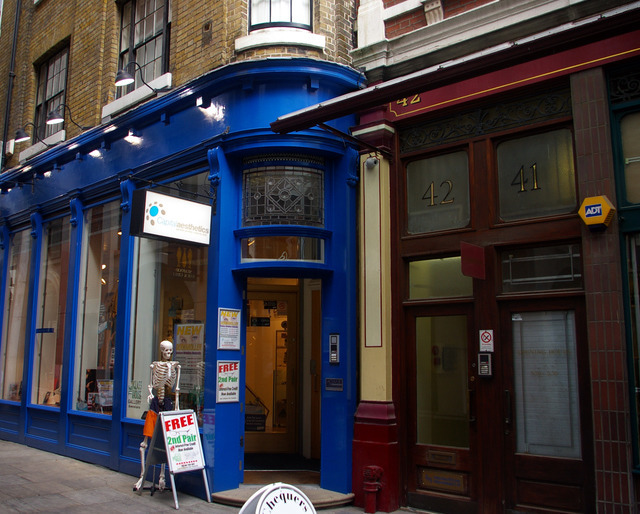 The shop next door at Number 8 is the Third Hand Bookshop, (on Charing Cross Road in the books), where Harry meets Gilroy Lockhart, his future tutor. The imposing Australian High Commission in London, Australia House is used as Gringott's Bank in several of the Harry Potter films. While its wonky exterior is clearly the work of some CGI, peek inside the doors and you'll see the gorgeous marble interior and sparkling crystal chandelier that's destroyed by our favourite wizarding trio and a dragon in Harry Potter and the Deathly Hallows Part II (about 1 minute into the clip below). Harry Potter and Mr Weasley use Westminster tube station in Harry Potter and the Order of the Phoenix on their way to Harry's hearing at the Ministry of Magic. "Trains! Underground! Ingenious, these Muggles," says muggle sympathiser Mr Weasley. Neither his excellent muggle knowledge nor his magic powers stop him struggling with the barriers though. Think of that next time your oyster fails to a volley of passive-aggressive tutting behind you. From Westminster tube, it's on to the Ministry of Magic in Westminster. If you're looking for the red phone box that makes the visitor's entrance, you'll be disappointed. The box, located in Great Scotland Yard, running between Whitehall and Northumberland Avenue, at the junction with Scotland Place, was only added for filming. As the excellent movie-locations.com notes, if there's half a trolley in Kings Cross, couldn't someone move a phone box here to create a brilliant photo opportunity? Then the Death Eaters swoop, taking in some top London landmarks: Trafalgar Square, St Martin in the Fields, Charing Cross Road, past Leicester Square tube station, before turning right into Great Newport Street, and into where Diagon Alley seems to be in this film. Ahh, the famous Surbiton Station, immortalised in Harry Potter and the Half-Blood Prince. Except... it's not quite right. There's a blink-and-you'll-miss-it moment for the south west London station; Harry meets Dumbledore on Platform 3 (below a nudge-nudge, wink-wink built-for-the-film billboard) before the pair apparate off to the village of Budleigh Babberton. But if you're looking for the moody station cafe where Harry reads his Daily Prophet and nearly gets a date with a gorgeous waitress, well, it doesn't really exist. After all the film premieres in London's West End, Ron, Harry and Hermione finally get to London's theatreland in Harry Potter's final chapter, Harry Potter and the Deathly Hallows Part 1. Escaping from the attack on Bill and Fleur's wedding, the trio apparate to Piccadilly Circus, at the foot of Shaftesbury Avenue, narrowly missing a speeding No19 bus. Their adventures in the West End include an eventful cappuccino in a cafe that's actually a set. The trio then walk through the terribly unglamorous Trocadero columns on Great Windmill Street, before heading back to Piccadilly Circus. Professor Flitwick’s Charms Class in the first Harry Potter film, where Hermione manages to levitate a feather (Wingardium Leviosa! if you're wondering), takes place in the Fourth Form Room of Harrow Old Schools, Harrow-on-the-Hill. Hermione's lovely house in NW11 is Heathgate at Meadway in Hampstead Garden suburb, a gorgeous part of London built in the early 20th century, but modelled on a Medieval village, centred around the church of St Jude-on-the-Hill, seen at the end of this moving clip. If you're interested in doing a Harry Potter tour in London, you're slightly spoilt for choice. You can choose a free DIY tour, courtesy of Richard Jones, downloadable from the-magician.co.uk. Alternatively, check out muggletours.co.uk for a guided walking tour; or britmovietours.com/harry-potter-london-tour for a three-hour mini bus tour of London's Harry Potter locations. There's a permanent Harry Potter merchandise store inside Kings Cross Station. 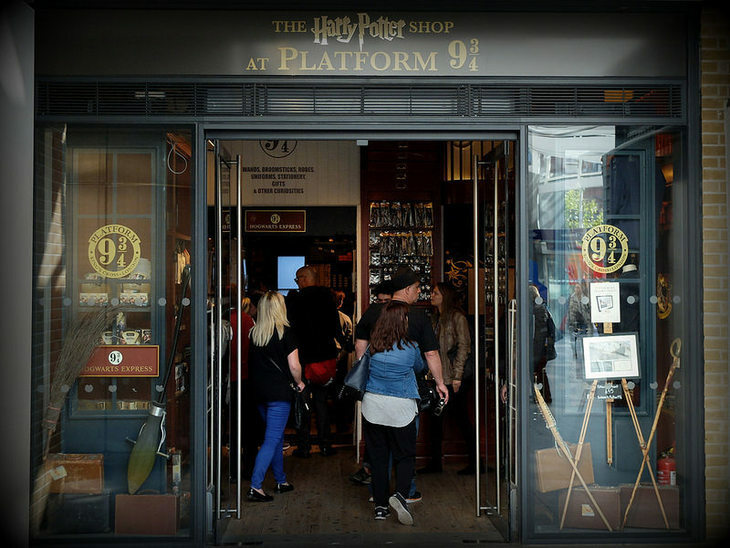 Called The Harry Potter Shop at Platform 9 3/4, the store offers Potter souvenirs like pens and pencils themed around the Hogwarts' Houses, as well as books, cuddly toys, clothing and wands.